Box Text: In the air...in the deep...on the battlefield. 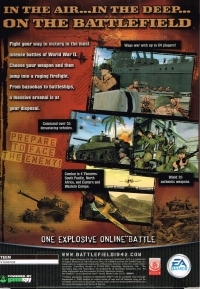 Fight your way to victory in the most intense battles of World War II. Choose your weapon and then jump into a raging firefight. From bazookas to battleships, a massive arsenal is at your disposal. 07-21-2013 Seikenfreak Box Text In the air...in the deep...on the battlefield. Fight your way to victory in the most intense battles of World War II. Choose your weapon and then jump into a raging firefight. From bazookas to battleships, a massive arsenal is at your disposal. 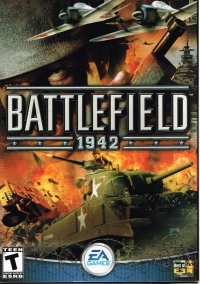 This is a list of VGCollect users who have Battlefield 1942 in their Collection. This is a list of VGCollect users who have Battlefield 1942 in their Sell List. This is a list of VGCollect users who have Battlefield 1942 in their Wish List.